This article is the second part of a two-part series of articles which was not published in the Belt Pulley magazine. A McCormick-Deering Little Genius No. 8 two-bottom plow with 14 inch bottoms mounted on steel wheels. In 1940, as previously noted, a particular farmer and his wife were engaged in diversified farming on a 160 acre farm in Dryden Township in Sibley County, Minnesota. (See the first article in this series called “A McCormick-Deering ‘Little Genius’ Plow in Dryden Township [Part I]” contained in the January/February 2009 issue of Belt Pulley magazine.) Also as noted previously, our Dryden Township farmer had used the money received from the unusually large “bumper” corn crop of 1939 to purchase a used 1935 Farmall Model F-20 tractor, a two-row mounted cultivator and a new two-bottom McCormick-Deering “Little Genius” No. 8 plow with 14 inch bottoms from his local International Harvester Company (IHC) dealership—Thomes Brothers Hardware located in Arlington, Minnesota (1930 pop. 915). 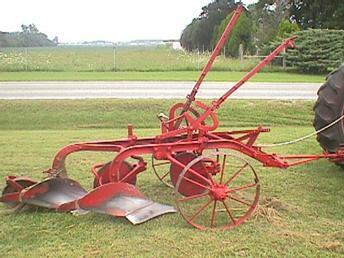 The McCormick-Deering “Little Wonder” 2-bottom plow was the predecessor to the Little Genius No. 8 plow. Continued production of the Little Wonder threatened to permanently ruin the International Harvester Company’s reputation as a plow manufacturer. Introduction of the “Little Genius” plow turned all of that around, however. In reaction to the criticism of the Little Wonder plow, the Little Genius plow was designed to be a much heavier plow. Furthermore, the Little Genius was unmatched in clearance under the frame. The Little Genius could handle a great deal of trash without clogging. Additionally, the bottoms of the Little Genius plow were more sharply angled to assure a complete roll over of the soil and to completely bury trash that was lying on the surface of the ground. Thus, the Little Genius tended to work well in fields with a lot of trash on the surface of the ground. However, the sharp angle of the bottoms of the Little Genius plow meant that the plow had an increased load or draft as the plow was pulled across the field. Thus, the Little Genius plow needed to be matched to tractors with more horsepower than mold board plows designed with a less angle to their bottoms—such as the Oliver A-series Model 100 Plowmaster. Our Dryden Township farmer was pleasantly surprised at the low price that Thomes Bros. offered for the purchase of the used 1935 F-20 tractor, the new cultivator and the new Little Genius plow. So, in the early spring of 1940, he signed the sales agreement with the Thomes Bros. Hardware dealership to purchase the tractor, plow and cultivator. Our Dryden Township farmer was anxious to get into the fields with the tractor and new plow and so he took immediate delivery of the tractor and plow. The winter of 1939-1940 was colder than normal with more than the usual amount of snow. Accordingly, it looked as though, the spring field work would be delayed because of the large amount of snow. A gray-painted Farmall Model F-20 tractor with red painted steel wheels. The more a person works at restoration of an old farm tractor or a farm implement the more one begins to ponder the history of that farm implement. One wonders, who originally purchased the farm implement. What kind farming operation was the implement used for? If curiosity is sufficiently aroused the person restoring the tractor or implement may start making telephone calls back to the person who sold the tractor and may start attempting to establish a chain of ownership of the tractor or implement back to the original owner. However, the process of establishing the chain of ownership can be extremely difficult as time passes and memories fade. Furthermore, when purchases of tractors and farm implements are made, as many are, at swap meets and/or auctions and when such purchases are made for cash from individuals unknown, the chain of ownership can be extremely difficult to reconstruct. (Just how difficult it is to start reconstructing the history of a tractor when time passes is described in the two-part series of articles contained in the July/August 2008 and November/December 2008 issues of Belt Pulley magazine which deal with a 1937 Farmall Model F-20 tractor.) Thus, it is often important to collect history of a particular tractor or implement at the point of sale or at least collect telephone numbers to call back at a later date. The 1937 F-20 bearing the Serial No. 71355. Such pondering over the history of the history of a particular implement was particularly true during the restoration of one particular McCormick-Deering Little Genius 2-bottom plow with 14″ bottoms. (The actual restoration of this plow is described in the article carried on page 11 of the September/October 1994 issue of Belt Pulley magazine [Vol. 7, No. 5. This article is called “The McCormick-Deering Little Genius Plow” and has also been posted on this website.) This particular plow was purchased by Mark Wells at the 1993 LeSueur County Pioneer Power Swap Meet. Luckily, Mark Wells had written down the name and address of the seller of the plow–Larry Hiles of rural Arlington, Minnesota. Arlington, Minnesota is located in eastern central Sibley County. Sibley County is located in the rich farm land of southern Minnesota. As described in the article in the September/October 1994 issue of Belt Pulley, cited above, this particular Little Genius plow was fitted with 14 inch bottoms and originally had been a steel wheeled plow fitted with McCormick-Deering’s own “round-spoke” steel wheels. However, the front wheels on this particular plow had been cut down and rims for rubber tires had been welded onto the round spokes of the front wheels. As noted in the above-cited article, although the “furrow wheel” on the right side of the plow had been fitted with a rim for a 6.00 x 16 inch rubber tire, the land wheel on the left side of the plow was fitted with a rim for a 4.75 x 19 inch tire. This seemed a rather odd pairing of tires sizes for the front of the plow. If a farmer were having the steel wheels of the plow cut down to mount rubber tires on his plow, why would he not make the tires on both sides of the plow the same size? Before the Second World War very few farm implements were sold from the factory with rubber tires. Nonetheless, as noted in the 1994 article, the International Harvester Company (IHC) had been offering the Little Genius plow to the farming public with the option of rubber tires as early as the 1930s. Rubber tires were not a common option on the Little Genius plow in the pre-world War II era. However, during the “pre-war” era, IHC had a contract with the French and Hecht Company (F.& H.) of Davenport, Iowa, to supply rims for all the rubber-tired equipment sold under the McCormick-Deering name. Pursuant to this contract, F.& H. supplied their familiar “round spoke” wheel rims to IHC. When the option of rubber tires were requested on the Little Genius plow, IHC fitted the plow with a 6.00 x 16 inch tire on the furrow wheel and a 4.75 x 19 inch tire on the land wheel. This followed the design pattern of the original steel-wheeled Little Genius plow, in which the land side wheel was bigger in diameter that the furrow wheel. The reason for this wheel configuration was that the land wheel was the wheel connected to the clutch of the plow. The clutch on the land wheel was the mechanism that lifted the entire plow out of the ground when the trip rope was pulled at the end of the field. Consequently, it was thought that a larger diameter wheel was needed to provide the traction and leverage necessary to pull the plow out of the ground in some heavy soil conditions where the surface of the ground was slippery. This was the situation when plowing succulent green vegetation (green fertilizer) into the soil. The land wheel rolling along on the vegetation could become slippery from the succulent plant life crushed under the land wheel. Then when the trip rope in pulled the land wheel might slide along the surface of the ground rather than continuing to turn and lifting the plow out of the ground. Accordingly, it was decided that the land wheel should be larger in diameter so as to provide more leverage when the clutch was engaged to pull the plow out of the ground. As a result, the steel-wheeled version of the Little Genius plow was fitted with a 30 inch steel wheel on the land wheel side of the plow and a 24 inch steel wheel on the furrow wheel side of the plow. The 30 inch steel wheel that was the original standard equipment wheel on the left side (land side) of the plow. Thus, when the optional rubber tires were installed on the Little Genius plow at the factory in Canton, Illinois, the plow was fitted with a land wheel and tire of a larger diameter than the furrow wheel of the plow. During the immediate pre-war era, the 6.00 x 16 inch tire was becoming the most commonly used tire on automobiles. However, the 4.75 x 19 inch tire was also a well-known and popular size tire, it was the size of tire that was used on the very popular Ford Model A car. Thus, the configuration of a 6.00 x 16 inch tire on the furrow wheel and a 4.75 x 19 inch tire on the land wheel became the standard configuration for Little Genius plows sold with rubber tires before the Second World War. A 1941 picture of the showroom of the Johnson Bros IHC Dealership of Taylorsville, Illinois bears this out. In the foreground of the picture is a new rubber-tired version of the Little Genius plow with a 6.00 x 16 inch tire on the furrow wheel and a 4.75 x 19 inch tire on the land wheel side of the plow. Inside the showroom of a typical McCormick-Deering dealership in the immediate pre-war period of 1940 and 1941. During the Second World War hardly any rubber was available for civilian use. Consequently, IHC reverted to steel wheels on its new farm equipment. Some time during the Second World War, the contract with F.& H. was terminated and IHC signed another supply contract for rims with the Electric Wheel Company of Quincy, Illinois. The wheels provided by the Electric Wheel Company were “disc-type” wheels. Thus, the “post-war” McCormick-Deering Little Genius plow becomes distinguishable from the “pre-war” Little Genius plow fitted with rubber tires, in that disc-type wheels characterized post-war Little Genius plows and F.& H. round-spoke wheel rims characterized pre-war Little Genius plows fitted with rubber tires. Thus, when cutting down the steel wheels of the Trebesch plow, someone had done a lot of work to make the plow appear as though it came from the factory as a rubber tired plow during the pre-war era. The left side (land side) wheel on the Delmer Trebesch 2-bottom plow that was fitted with a 19 inch by 4.75 inch Model A Ford car tire. Grafton Potato Growers Inc.: A major potato buyer of potaotes in Grafton, the county seat of Walsh County, North Dakota. As noted previously, Walsh County, North Dakota borders the Red River of the North in eastern North Dakota. (See the first article in the series called “Potato Farming in North Dakota [Part I]” contained in the July/August 2008 issue of Belt Pulley magazine.) Because of its location and its light rich soils, Walsh County traditionally leads all 53 counties of North Dakota in the production of potatoes. Indeed, some years, Walsh County produces 40% of the North Dakota’s total annual potato crop. Walsh County is divided into 37 townships. The townships on the extreme eastern edge of Walsh County that border the Red River are not the leading townships in the county in potato production. Rather it is the “second range” of townships back from the Red River that are regarded as the best locations for the growing of potatoes. Among this second tier of townships in Walsh County is Martin Township. A map of North Dakota showing the location of Walsh County. The eastern boundary of North Dakota is formed by the Red river of the North. As noted previously, Martin Township was, in 1936, the home of a particular farmer and his wife and two children. Together they lived on a diversified 160-acre farm on which they raised potatoes as a primary cash crop. However, they also raised spring wheat, corn, oats and hay. They also milked a small herd of Holstein dairy cattle. They had a chicken house full of laying hens and a few hogs in an attempt to diversify the sources of farm income as much as possible. Consequently, a large portion of the arable land of their farm was taken up by pastureland and crops used as feed for the animals on the farm. Martin Township was located so far north in the Midwest that the typical growing season was only 110 days long, extending only from an average last frost in the spring on about May 11 until the first killing frost in the fall on about September 11. Corn which requires a 120-day season, does not, therefore, have enough time to mature in Martin Township. This far north, corn is not a cash crop and is used as an animal feed on the farm. Consequently, all the corn, raised by our Martin Township farmer was chopped green and put in the silo to be fed to his dairy herd. Only wheat and potatoes were sold as cash crops. A township map of Walsh county showing the location of Martin Township north of the county seat of Grafton, North Dakota on the northern border of Walsh County. An advertisement of the Grafton Implement Company, which formerly had been known as the Honsvald Oil Company. No. 71355 was a tricycle-style tractor with a narrow front end, and factory-installed 5.50 x 16 inch rubber tires mounted on French and Hecht (F. & H.) round-spoke wheels in the front and 11.25 x 24 inch tires also mounted on F. & H. round-spoke tires in the rear. Because the tractor had been fitted with rubber tires at the International Harvester Farmall Works factory in Rock Island, Illinois, No. 71355 was also fitted with the optional foot brakes and was fitted with the optional 28-tooth high speed road gear. With the more common 36-inch rubber wheels in the rear, this optional road gear would have delivered a speed of 7.07 miles per hour (m.p.h.) to the tractor. A Farmall model F-20 tractor configured with 24 inch rubber tires in the rear and French & Hecht round-spoke rims front and rear, just as No. 71355 was configured when it arrived at Honsvald Oil Company in Grafton, North Dakota. The narrow front end of the tricycle-style of No. 71355 would provide our Martin Township farmer with the ability to perform all the field activities on his farm including the cultivation of row crops. However, because No. 71355 was fitted with the optional 24-inch wheels in the rear, the speed of the tractor in every gear was reduced by almost 1/3. Accordingly, the speeds available to No. 71355 through its four speed transmission were 1.575 mph in first gear, 1.925 mph in second gear, 2.275 mph in third gear and 4.666 mph in the optional fourth gear. A Heisler step-up transmission mounted on a Farmall model F-20. Because this range of speeds was painfully slow for cultivation and other light duty field work, our Martin Township farmer had agreed to the installation of a supplemental high-speed transmission to No. 71355, as a part of the original purchase contract. The particular high-speed supplemental transmission installed by the Honsvald Oil Company to No. 71355 was the Model HT-2033 supplemental transmission manufactured by the Heisler Company of Hudson, Iowa. (Ibid.) The Model HT-2033 supplemental transmission added some very important working speeds back to the tractor that had been taken away by the 24 inch wheels. These were 3.654 mph in high range of first gear, 4.46 mph in high range of second gear, 5.25 mph in high range of third gear. Additionally, the new Heisler transmission added a road gear of 11.28168 mph to the F-20 for fast transport down the road when needed. To be able to use No. 71355 for the most important of summer field work tasks, i.e. cultivation of the row crops, our Martin Township farmer had included the purchase of a Model 229 two-row mounted cultivator as part of the same sales contract with Honsvald. Additionally, as noted previously, the purchase contract with Honsvald Oil Company also included the purchase of a new Model 12 two-row potato digger. This advertising photo for the new Model 12 two-row potato digger shows that when the F-20 tractor is fitted with 24 inch wheels in the rear the tractor can pull the two-row potato digger. This convinced our Martin Township farmer to include a Model 12 two-row potato digger as a part of the purchase package with No. 71355. Throughout most of January and early February, 1937, there had been accumulations of ten to twelve inches of snow on the ground. However, unseasonably warm temperatures in early March melted the snow entirely by the middle of the month. Now our Martin Township farmer had to wait for the soil to dry out and warm up. Our Martin Township farmer knew of the old “rule” which stated that potatoes should be planted each year on Good Friday of the Easter holidays. However, like most such rules, our Martin Township farmer knew that this rule did not apply to the “far north” of the Midwest where Grafton, North Dakota was located. Most years in Walsh County, the last heavy frost in the spring occurred in early May. Furthermore, he suspected that the old rule referred to potatoes planted in gardens in “sheltered” areas around the homestead. He knew that the soil out in the open fields took a little longer to warm up in the spring than did the soil in the protected areas around the house. In the spring of 1937, our Martin Township farmer was able to use the same Little Genius No. 8 two-bottom plow with 14 inch bottoms with No. 71355, which he had used the previous autumn with his old Model 10-20 tractor, to finish the plowing of his fields. April, 1937 was slightly warmer than normal and so was early May. The last cold night that even approached a killing frost occurred in mid-April. Furthermore, the gentle rains that occurred throughout April and May helped warm the soil. These springtime rains dried quickly in the light soil of his farm and did not unduly delay the field work because of wet conditions. Accordingly, our Martin Township farmer got into the fields in early May of 1937. He put the bright, red No. 71355 to work preparing seed bed. Both the spring wheat and oats could germinate in soil as cool as 37°F while seed potatoes required a temperature of 42°F. Therefore, our Martin Township farmer and his neighbors usually sowed the spring wheat and the oats before planting the potatoes. By contrast, corn required a soil temperature of 50°F for planting. Accordingly, corn was planted only after the potatoes. Cutting the seed potatoes into pieces, by hand, so thatevery piece included at least two “eyes,” was a wintertime activity when potato plots were small. The pieces would then be placed in sacks to await springtime planting. Meanwhile the cut edge of the potato piece would “cure” to prevent rot. The sacks of potato pieces would have to be stored in the cellar of the house; warm enough to keep them from freezing and yet cool enough to retard early sprouting of the eyes of the potato pieces. Cutting the seed potatoes into pieces ready for the potato planter was a job that employed the whole family and it was an ambitious job to be conducted each spring as planting time arrived. The average potato might weigh 8 to 12 ounces. After cutting the potatoes into pieces ready for planting, each piece would weigh about 2.5 oz to 3.75 oz. In the past, potato growers and their families would cut all the potatoes by hand with a knife. Our Martin Township farmer remembered that even as a small child, he helped his parents with this daunting task of cutting the potatoes for planting. His mother would admonish him to be careful to leave two or three “eyes” on each piece of potato he cut. “Don’t make dummies,” she said, referring to potato pieces which had no eyes. The eyes of the potato were the locations on the potato where the spouts of the new plant would begin to form once the potato was underground. Leaving two or more eyes on a seed potato piece would be extra insurance that the seed potato piece would still sprout and grow even if one eye failed to sprout. Our Martin Township farmer’s mother used to joke with him as a child and say that the potato piece needed two eyes to see which way to grow. Pre-sprouting of the seed potatoes reveals the locations of the “eyes” of the potatoes. Once cut, the seed potato pieces would be placed in a sack and sacks full of potato segments would be placed in the root cellar where the potato pieces would be kept warm enough to not freeze in the winter weather and would be kept cool enough not start sprouting. Additionally, the cut sides of the potato pieces would “cure” or “heal over” and the potato piece would be protected from rotting. He remembered that cutting seed potatoes by hand was a long and arduous task in the spring because the family would have to cut enough potatoes to plant 11,600 pieces for every acre of land they intended to plant to potatoes. This meant the family would have to cut enough pieces to fill as many as 14 sacks of potato sections for each acre of potatoes they wished to plant. Currently for the 30 acre field that our Martin Township farmer wished to plant to potatoes, he needed 420 sacks full of seed potato pieces. Cutting this many seed potatoes would have been impossible for the family alone without hiring on extra help. However, a relatively recent and ingenious invention made in the 1920s by a local boy, greatly reduced the hand labor of cutting the potatoes into sections in the spring. During the 1920s, George W. French, from rural Grafton, North Dakota, invented a mechanical potato cutter which would cut small potatoes into two pieces and large potatoes into six pieces. (Lynda Kenney, The Past is Never Far Away: A History of the Red River Valley Potato Industry [Potato Growers Association Press: East Grand Forks, Minn., 1995] p. 123.) The French potato “sizer and cutter” was a new invention that greatly reduced the amount of time that was taken up cutting potatoes for planting. French’s potato cutter also “sized” the potatoes for planting with a mechanical potato planter. Mechanical potato planters worked much more smoothly when the seed potato pieces were cut into relatively uniform chunks. The French potato sizer and cutter did a good job at creating uniform chunks for planting in the field. If seed potato pieces are stored in too warm of an environment, they will begin to sprout and grow before they be planted in the Spring. Although the French mechanical potato cutter could not assure that every seed potato piece that was produced by the machine would have an eye, the process of cutting a great number of seed potato pieces for planting was simplified. Thus, some “dummies” or “duds” would escape the careful attention of the potato farmer and his family in the automatic cutting process and make it into the sacks of potato pieces that would be stored in the root cellar and may be planted in the field. other seed potato pieces and would be planted even though they would not grow. When the potatoes would sprout up through the ground there would be a “gap” or a blank in the row where the dummy had been planted. Our Martin Township farmer began to expect and to tolerate these occasional gaps in the rows of growing potatoes. He surely did not want to go back to hand-cutting the potatoes with a knife, just to eliminate all dummies. It began like so many other purchases of antique farm machinery. The late Wayne A. Wells purchased a Farmall Model F-20 at the 1992 LeSueur County Pioneer Power Swap Meet. Wayne paid for the tractor by means of a check. Wayne had the habit of making virtually all purchase transactions by means of a check—a habit that has been inherited and is carried on to further extremes by his son, the current author. Future events would prove how extremely fortunate it was that the purchase was made by means of a check. No. 71355 powering the Wallace Bauleke/Paul Meyer 22 inch McCormick-Deering thresher at the 1993 LeSueur Pioneer Power Show.. This web-site contains an independent article on the history of the Wallace Bauleke/Paul Meyer thresher. This particular F-20 was missing its serial number tag. However, the serial number imprinted on the frame of the tractor was 71355. The tractor was fitted with two 6.00 X 16 inch car tires mounted on IHC cast iron drop-center, or demountable, rims in the front. One of the first improvements to the tractor was to replace these old car tires with two new 5.50 X 16 inch tri-rib tires. No. 71355 was also fitted with 13 X 36” rubber tires mounted on IHC cast-iron demountable rims in the rear. The rear tires were in extremely bad shape and in April of 1993 they too were replaced with brand new tires. No. 71355, having already been painted but still with the old rear tires,,undergoes an overhaul during Christmas of 1992. No. 71355 was only the second tractor to be restored by Wayne Wells, (the first tractor to be restored was the 1945 Farmall B bearing the serial number 130161, which is mentioned in the article called “Farmall B: Second Tractor on the Farm, but First in the Heart” contained in the November/December 1993 issue of Belt Pulley), both Wayne and his two sons, Mark and the current author, were anxious to parade the tractor at the LeSueur County Pioneer Power Show to be held on the last weekend in August 1992. Accordingly, No. 71355 was painted prior to any overhaul of the engine being performed. (Indeed, a very “smoky” but painted, No. 71355 can be seen being driven by Mark Wells in the parade at the 1992 LeSueur Show in the second hour portion of Disc/Tape No. 1 of the International Harvester Promotional Movie collection. No. 71355 was painted in August of 1993 an was overhauled during Christmas of 1993. While No. 71355 was the second tractor restored by Wayne A. Wells, the 1945 Farmall Model B bearing the serial number 130161 was his first restoration project. As the restoration of No. 71355 proceeded, history of the tractor was examined. Nothing of the actual history of No. 71355 was known. Consequently, the history of the tractor was a topic of speculation. Ordinarily a telephone call to the seller of the tractor would have been the starting point for the research into the history of the tractor. However, time had passed since the purchase of No. 71355 in April of 1992 and the canceled check bearing the name of the seller of No. 71355 was placed away in storage with the financial papers of the Wells family. With the check used for payment on the tractor not readily at hand, the seller’s name was not available and not even a beginning could be made as to researching the actual history of the tractor. Only the features of the tractor itself could be used as clues as to the tractor’s past. Luckily, the particular and unique features of No. 71355, reveal a good deal about the tractor. The tricycle design of farm tractors was introduced by the International Harvester Company in 1924 with the “Farmall” tractor. Soon nearly all farm tractor manufcturers around the world were copying the tricycle design for their “row crop” tractors. First and foremost was the “tricycle type” design of No. 71355. The tricycle design positioned the front wheels of the tractor close together. This configuration allowed the tractor to work in crops which were planted in rows as narrow 30 inches apart. As a tricycle “row crop” tractor, both front wheels of the tractor were attached to a single bolster. Thus, both front wheels shared a single pivot point. This type of steering is called “fifth wheel” type of steering and is different than the “automotive type” steering found in “standard” or “four-wheel” designed tractors in which each wheel has its own pivot point located at the “journal” for that particular wheel. The fifth wheel type of steering allowed the tricycle designed tractor to turn much more sharply than the automotive type steering. Thus, the tricycle design and the ability to turn very sharp corners made No. 71355 ideally suited for row crop farm work. The single pivot point on the front of the Farmall tractor was the steering bolster on the tractor located in front of the radiator. The particular “open” (non-enclosed) gear and sector plate style steering on the early Farmalls (now called the Farmall Regular) made the Regular somewhat dangerous to drive over rough or rocky ground. After 1932, the Regular was modified and improved and became the Farmall Model F-20 tractor. One of the main improvements made to the Farmall Regular in 1932 was the replacement of the open gear and sector plate type steering with a “worm gear” type of steering in the new F-20. As a result the Farmall Model F-20 tractor was much easier to steer than the Regular. The 28-tooth sliding gear that would replace 3rd gear in the Farmall Model F-20 transmission to allow the tractor to have a 7.07 mph road speed. Mark Wells discs the newly plowed fields on the grounds of the LeSueur Pioneer Power Show with No. 71355 in August 1994. Loss of the traditional 3rd gear meant a loss of the 3-3/4 mph speed .on No. 71355 meant the loss of a light field work speed. Installation of this optional road gear was made available only on those F-20s which were fitted with rubber tires. (Ibid. p. 72.) Accordingly, it was determined that No. 71355, rolled off the assembly line at the Farmall Works in Rock Island, Illinois, fitted with factory-installed rubber tires. However, when No. 71355 was manufactured in the second week of December, 1936, the tractor could not have been fitted with the same 36 inch cast-iron wheels with demountable rims that are now mounted on the rear of tractor. Only in March of 1937, (beginning with the particular F-20 with the serial number 79522) did F-20 tractors begin to be fitted with these International Harvester-made cast-iron demountable rear wheels and rims for rubber tires. (See the F-20 Parts Book page 207.) Prior to March of 1937, IHC relied on an outsource contract, they had signed with the French and Hecht Company of Davenport, Iowa, to supply all the rear wheels for all their rubber-tired tractors. The French & Hecht Company factory located in Davenport, Iowa, where the round spoke wheel rims were manufactured. Factory Installation of the high speed road gear in the transmission of No. 71355 indicates that rubbers tires were also installed on the rear of the tractor. Still the IHC-made drop-center rear wheels that are now mounted on rear of No. 71355 could not have been factory installed on the tractor. Prior to that time, IHC again relied on its contract with the French and Hecht Company to supply round-spoke rims for all F-20 tractors fitted with 5.50 X 16” rubber tires in the front. (A French and Hecht round-spoke rim is pictured on page 174 of the F-20 parts book.) Accordingly, when No. 71355 rolled out of the Farmall Works in Rock Island, Illinois, the tractor did so with rubber tires mounted on French and Hecht round-spoke wheel rims on the front as well as the rear. A Farmall Model F-20 is delivered to a dealership with smaller 28 inch French & Hecht “round spoke” wheels in the rear, but disc-type wheels in the front. Some time after No. 71355 was initially purchased, the tractor was fitted with an auxiliary transmission manufactured by the Heisler Manufacturing Company of Hudson, Iowa. This auxiliary transmission was located on the power train of the tractor in the open space between the clutch housing on the engine and the standard transmission. The Heisler auxiliary transmission provided a high range to all the standard speeds of the transmission—in fact doubling the number of speeds available to the tractor. A Heisler model H-9 series “step-up” transhission installed on a Farmall F-20 tractor. The tag on the Heisler unit appears to indicate that the gearing of the Heisler unit will increase the speed of the tractor by 2.3 times normal speed in each gear. A advertisement of the full line of Farmall tractoirs. On this hog farm, Christmas was an important time for the farming operation because it was “farrowing time” for the registered purebred Poland China sows that were owned by our Byron Township farmer. He was pleased to see that each of his sows had given birth to a large litter of baby pigs during this farrowing season. Furthermore, the sows and baby pigs all seemed to be adjusting well to each other. The Poland China sow is known to be a good mother to her pigs, but, as noted in the previous article, our Byron Township farmer had made the decision last summer (1935) to enlarge his breeding stock by adding four new bred gilts. He now had twelve sows and twelve litters of baby pigs rather than a mere eight litters of previous years. The four new gilts were “first time mothers.” Our Byron Township farmer always worried about the emotional reaction of first-time mothers to their first litter of pigs, but now in the weeks following the holidays, he could see that even the young gilts were getting along well with their baby pigs. Sows farrowing baby pigs in separate pens with their litters in a summer time hog house. The farrowing season kept our Byron Township farmer busy with chores in the hog house. The whole hog house was divided into separate pens as each of the twelve “families” had their own pen. Each sow had to be fed and watered in her own pen twice a day. As the baby pigs became larger and were able to get around relatively independently, there was less chance of them being, accidentally, laid on and crushed to death by their mother or by the other large sows. Accordingly, the partitions separating each mother and their litters could be removed and the sows and their litters could be allowed to interact with each other. Feeding and watering would be more communal and could be simplified to take less time. Nonetheless, the “hog house chores” of feeding and watering remained a twice-a-day activity. No longer housed with their mothers, the weanling piglets share communal feeding and watering and living accommodations with each other. In these living conditions the piglets become strongly bonded with which other and react as a group to any sudden scare. Having enlarged his breeding stock by 50%, our Byron Township farmer would now have 50% more feeder pigs to raise than in previous years. Thus, our Byron Township farmer knew that he would be busier this year than ever before—especially, once the springtime field work began. Currently, our Byron Township farmer had two Farmall Regular tractors available to him on his farm. Although one of the Farmall Regulars actually belonged to his father, who lived on a separate farm building site located about a ½ mile away. His father still regularly helped with the day to day farming activities. They had purchased both of these Farmall Regulars in 1928 with the intent of speeding up their summertime work of cultivating the corn. Now when they went to the field in the summer with the cultivators mounted on both tractors, they could cover a lot of ground in a short time. However, they had purchased the two tractors seven years ago. His father was not as able to do manual labor around the farm as he had in the past. After all, his father had actually retired and sold the farm to our Byron Township farmer seven years ago. This last August at the 1935 Minnesota State Fair, while the family was making their annual trip to show the pigs at that fair, our Byron Township farmer had been intrigued by what he saw at the large International Harvester Company exhibit on “Machinery Hill” on the fairgrounds. The 1935 State Fair was his first real chance to see the full line of tractors that the International Harvester Company was now offering to the farming public. In July of 1931, International Harvester had introduced a new larger Farmall tractor (Oscar H. Will & Todd Markle, Collector’s Originality Guide: Farmall Regular and F-Series [Voyaguer Press: St. Paul, Minnesota, 2007] p. 51). When tested at the University of Nebraska from October 9 through October 23, 1931, the new larger Farmall was shown to deliver 20.27 horsepower (hp.) to the drawbar and 30.29 hp. to the belt pulley. Because of its belt horsepower rating, the tractor became known as the Farmall 30, or the F-30 for short. Our Byron Township farmer had a close-up inspection of the Farmall Model F-30 at the International Harvester tent at the 1935 Minnesota State Fair. The three townships along the southern boundary of Waseca County from east to west are New Richland Township, Byron Township and Vivian Township. A person driving down any dirt road the within these townships in 1935, would see corn fields on both sides of the road, broken only by the driveways leading to the homesteads of the people living along that particular road. For nearly every mile that a person traveled down that country road, the person would find another crossroad. The crossroads usually indicated the boundary of another section of land. Moving ahead into the next section of land the person would once again find corn planted in the fields on both sides of the road. The only variation in this pattern was the fields of oats and hay. Corn was the primary cash crop of farmers of Waseca County. Oats and hay were not cash crops. Almost all oats and hay raised on the average farm in 1935 was used on the farm—primarily to feed the horses that were needed for the field work in the summer. A map of Minnesota which highlights the location of Waseca County in red. Relying only on corn as a cash crop was risky. If the corn market went “soft” and corn prices fell, the farmer would lose money. Traditionally, diversification was the method used by farmers to avoid, or mitigate, the effects of “soft markets.” This was usually accomplished by decreasing the amount of corn raised on the arable land of the average farm and devoting that land to a second cash crop. Traditionally, wheat was raised as a secondary cash crop. However, the amount of acreage devoted to wheat each year had been declining in Waseca County for a long time. Currently, the amount of wheat raised each year was only about a quarter of the amount of corn raised in Waseca County. The most popular method of diversification used on the farms of Waseca County was to raise pigs. The rationale was that when corn prices fell, the farmer could feed the corn to pigs on their farm. Then they could sell the pigs. Provided that pork prices did not decline together with the corn prices, the farmer might still be able to make a profit despite the low corn prices. A township map of Waseca County, Minnesota, showing the location of Byron Township in yellow in the bottom row of Townships. One particular farmer in Byron Township in south central Waseca County, had this principle of diversification imprinted on his mind for most of his young life. Originally, his grandfather had “homesteaded” this 160-acre “home” farm. Our current Byron Township farmer’s father had taken over the farming operation from his parents in 1895. Like their neighbors, they needed to devote 35 acres to pasture for their small herd of dairy cows, 30-35 acres to hay and 35 acres to oats. The balance of the arable land, approximately 45 to 50 acres was devoted to corn. The crops were rotated from field to field each year to avoid depleting the soil with any one crop. This is an arieal view of a farm that looks much like the farm of our Byron Township farmer. A portion of the corn used on this farm had traditionally been used for raising and fattening pgs for market. However, the balance of the corn not needed for feed was sold to the grain elevator in New Richland in the winter of each year. The income derived from the sale of the corn crop made up a substantial portion of the cash income of the farming operation, milking the cows and selling cream to the local creamery in New Richland provided the family with a regular income on a year-around basis. Thus, the dairy operation represented another form of diversification of the farm income. The Creamery in New Richland, Minnesota. However, on our Byron Township farmer’s farm, it had always been the pig operation that provided the real diversification and alternate cash income when corn prices were low. All through the 1920s, the price of corn, cycled regularly from an average annual low of $.75 per bushel to an average annual high of $1.19 per bushel. Likewise, during the 1920’s, the wholesale price of hogs had cycled on an annual basis from an average low of $8.29 per hundred weight up to $11.21 per hundred weight. Raising pigs on the typical Midwestern farm was usually closely linked to raising corn, because a portion of the corn crop on the average farm could be used to fatten the feeder pigs for market in a relatively inexpensive way. Generally, the corn in the corn crib was shelled out in February or March each year. After filling the granaries to feed the pigs for the rest of the year, the remainder of the shelled corn could be taken to the grain elevator in New Richland straight from the sheller and sold. This provided the family with the major portion of their winter income on the farm. The feeder pigs generally reached their market weight in July or August and, thus, could be sold at that time. This provided the family with the major income in the summer. This was the pattern of life that our Byron Township farmer knew as he grew up on his parent’s farm. Gradually, over the years, as our Byron Township farmer grew up into an adult, his father relinquished more and more of the daily decision making regarding the farming operation to him. It became a true partnership. Basically, our Byron Township farmer agreed with his father on the course of the farming operation. His father had been raising pigs for years. Our Byron Township farmer had always been interested in the hogs. However, the hog operation took on a whole new importance on his mind when he began showing pigs at the Waseca County Fair. On the grounds of the Waseca County Fair with one of the most recognizable features of the Fair and, indeed, of the city of Waseca itself was the Prince popcorn wagon. His very first pig that he had raised and shown at the county fair had been one of the newborn pigs from one of the litters born to his father’s crossbred sows. That first pig was memorable because the pig had won a blue ribbon at the Fair that year. Winning the blue ribbon had been more the result of more luck than of skill on his part. Still he had been hooked. That blue ribbon perked his interest at an early age to find out all he could about the most profitable ways of raising pigs. Over their lives, hogs gain 3000% of their own birth weight. (Sara Rath, The Complete Pig [Voyageur Press: Stillwater, Minn., 2000] p. 78.) Furthermore, only a short amount of time required for raising the baby pigs for market—generally five to seven months. Combining this rapid weight gain with the short gestation period of three months, three weeks and three days from breeding until “farrowing” (giving birth), made the hog operation on the average farm the most profitable part of the farming operation. (Kelly Klober, Storey’s Guide to Raising Pigs. [Storey Pub. Co.: North Adams, Mass., 1997] p. 22.) This rapid turn-around in time from initial investment until profit in hogs compared with the nine month gestation period in cattle and then the nearly two years needed to bring feeder cattle up to their market weight. (See the article called “A 1931 Farmall at Work in Mower County, Minnesota” in the March/April 2008 issue of Belt Pulley magazine for a description of a small beef operation on a diversified Midwestern farm.) Our Byron Township farmer and his father both knew that this very rapid turn-around combined with fact that an average sow would farrow a litter usually contained ten baby pigs could generate a great deal of income for the farming operation and be a real “mortgage lifter.” It all depended on getting the baby pigs successfully raised to their full market weight. Proper management was the key. It all started with the mother sow. A young Poland China gilt, who is yet to have her first litter of baby pigs, is, nonetheless, regarded as being among the best natural mother of any breed of pigs. A 1929 Jnternational Harvester Cpmpany’s ,Farmall Regular, the first tricycle-style row-crop tractor. In the years before the First World War, the internal combustion tractor had shown great promise as an efficient power source for use on farms. Immediately following the First World War, that promise came into fruition as internal combustion powered tractors replacing work horses in the most arduous tasks on the average farm. During the 1920s, many farmers were performing their heaviest field work; e.g. plowing and discing, with farm tractors. However, one field task avoided mechanization and still required work horses. That was the cultivation of row crops—especially corn. The conventional “four-wheel” or “standard” style farm tractor was not suited, nor had it been designed, for to the task of cultivating row crops. The “standard” or “four-wheel” tractor, like the popular International Harvester Model 10-20 tractor pictured here, was the only style of tractor produced by the International Harvester Company and all other farm tractor manufacturers prior to 1924. Ever since 1915, the International Harvester Company had been experimenting with various proto-types and configurations of a motorized self-propelled cultivator. However, as important as a cultivating machine would be to the average family farm, a separate motorized implement, which would be used only for the task of cultivating row crops in the summer time and would be stored unused on the farm for the remainder of the year, was not deemed the most efficient use of the limited resources of the average family farming operation. Eventually, the minds the engineers at International Harvester, crystallized around the concept of redesigning the conventional farm tractor into a power source on which a cultivator could be mounted during the summer growing season and from which the cultivator could be removed once the cultivation of row crops was finished. Such a redesigned farm tractor could be used for all tasks on the average family farm on a year-around basis and could replace the horse entirely on the average family farm. Because such a redesigned tractor held the promise of performing all tasks on the farm, the International Harvester Company began calling this newly redesigned tractor the “Farmall” tractor. The International Harvester Motor Cultivator at work in the corn field. The conventional “standard” or “four wheel” style tractor had both front wheels mounted wide apart. Just like an automobile, the front wheels were spaced so that the rear wheels of the conventional tractor traveled in the same paths as the front wheels of the tractor. Additionally, the standard four wheel tractor had an “automotive style” type of steering in which each front wheel pivoted on its own bolster. Thus, the standard tractor could turn only as sharply as a car. On the other hand, the front wheels of the Farmall tractor were mounted close together in a narrow front end configuration. Both of the front wheels of the Farmall were mounted on the same bolster or pivot point which allowed the front wheels of the Farmall to be turned to a 90° angle from the straight forward line of the tractor. This type of steering is called “fifth-wheel” steering. Both because of the narrow front end and the fifth wheel type of steering, the Farmall tractor design has been called the “tricycle design.” The tricycle design of the Farmall tractor was ideal for the cultivation of row crops. Prior to the introduction of the tricycle-style Farmall Regular in 1924, the International Harvester Company made and sold only “standard” or “four-wheel” tractors like the Model 15-30 shown above. Note the front wheels are turning in an automobile-like style. Thus, in 1924, after nine years of experimentation, the new Farmall went into production at the old Tractor Works located at 2600 West 31st Boulevard (the corner of 24th and Western Avenue) in Chicago, Illinois, beginning with Farmall tractor bearing the Serial Number 0501. Only 199 Farmalls were produced in 1924. However, in 1925, the Farmall’s first full year in production, another 837 were manufactured. Only in 1926, did production of the Farmall hit its stride, with 4,418 Farmalls being made and sold in that year. The suggested retail price of these new Farmalls was $950.00. However, in October of 1926, production of the Farmall was relocated to a new factory—the Farmall Works located in Rock Island, Illinois. An aerial view of the International Harvester Company’s “Farmall Works” in Rock Island, Illinois. Introduction of the innovative new Farmall tractor coincided with some other industrial innovations—large and small. Some of these innovations were incorporated into the design of the Farmall, even after production of the Farmall had already begun. One such industrial innovation was rather small in size but proved to be a very important watershed in industrial and farm machine lubrication. This was the development of the grease gun and the small grease fitting called the “zerk.” This small innovation came to a great number of farms of North America, “piggy-backed” on the Farmall tractor. The grease zerk was destined to change a great number of practices on the farm. Oskar Zerk was the inventor of a number of common products, but his most important invention was tiny and simple grease zerk which came to be used every where on machinery and in industry. When the small combine was made available to the North American farmer at the end of the Second World War, there had been a revolutionary change in which small grains were harvested. The small combine entirely replaced the stationary thresher in a period of a very few years. Similarly, the introduction of the corn picker had quickly replaced the hand picking of corn and the stationary corn shredder on North America farms. To some degree, the expected revolutionary change did greet the introduction of the mechanical cotton picker. The cotton picker had swept the state of California by storm. Although, in 1949, only 12% of the cotton in California was harvested by machine, this figure mushroomed to 35% in 1950; then to 52% in 1952; to 60% in 1953 and up to 67% in 1956. Cotton growers in California recognized that mechanical picking of cotton cost only about $7.00 per acre, on average, as opposed an average of about $40.00 to have the same acre of cotton picked by hand. As noted in the above-cited article, however, California’s experience with the cotton picker was not repeating itself in the lower Mississippi River Valley. Statistics revealed that in 1957, while fully 67% of the cotton grown in California had been picked by machine, only 27% of the cotton of the lower Mississippi Valley was being harvested by machine. Even more dramatically, cotton farmers in South Carolina appeared to be even more reluctant than the cotton planters of the lower Mississippi River valley to adopt the mechanical method of cotton harvesting. Only 2% of the cotton raised in South Carolina in 1952 had been picked by machine. This figure had risen to 8% in 1954. However, since that time, use of the mechanical cotton picker had actually declined—to 4% in 1955 and 1957. In last fall’s harvest, 1958, use of the cotton picker had fallen to only 1% of all the cotton grown in South Carolina. Even those cotton farmers in South Carolina that had employed a mechanical picker in the past, now appeared to be reverting, once more, to hand picking of cotton during the 1958 harvest. Still, despite the slowness of sales of the cotton picker in South Carolina, Deere and Company remained hopeful that the change to cotton pickers would occur in South Carolina. Indeed, Deere and Company felt that 1959 might be the year when sales of mechanical cotton pickers “took off.” The Company rationalized that the decline in sales of cotton pickers in 1958 may well have been the result of the recession that had gripped the United States economy from August of 1957 until April of 1958. Thus, Deere and Company remained optimistic for the new year. Cotton pickers continued to be produced in large numbers at the John Deere factory works in Moline, Illinois and the Company continued to send large numbers of the cotton pickers to their regional branch/warehouses in the south including the one located at 5147 Peachtree Street in the Atlanta suburb of Chamblee, Georgia. This branch/warehouse served the local dealerships in the southeastern United States including those in the state of Georgia and South Carolina. The most popular cotton picker being offered by the John Deere Company was the Model 22. The Model 22 was a single row cotton picker that was designed to be mounted on a narrow front-end—“tricycle”—style “row-crop” tractor. The Model 22 cotton picker was only mounted on the tractor during harvest season. The cotton picker could be removed from the tractor at the end of the harvest season. Thus, the tractor would be free for other farm tasks throughout the rest of the growing season. As part of the process of mounting the cotton picker, the cotton farmer was required to open up the transmission of the tractor and reverse a gear in the transmission. This simple procedure would have the effect of allowing the tractor’s forward working speeds and road gear to act in reverse. Once the cotton picker was mounted on the tractor, the operator would sit on special seat on the cotton picker above the normal tractor operator’s seat and facing the rear of the tractor. The steering wheel, throttle, clutch and other controls of the tractor were modified and extended to be accessible from the new rearward facing operator’s seat on the cotton picker. The same wheels that steered the tractor in its normal configuration, now steered the tractor and mounted cotton picker in its new configuration. However, these wheels were now in the rear of the machine rather than at the front. The large driving wheels were now in the front of the machine. As noted in the previous article, the Model 22 cotton picker had been introduced by Deere and Company in the fall of 1956. (Ibid.) The Model 22 was designed to fit on any tricycle-style, row-crop version of either the John Deere Model 520, Model 620 or the Model 720 tractor. The four-plow Model 620 tractor proved to be the most popular tractor of the 20 series. During the two years of its production, 21,117 Model 620 tractors of the tricycle or row crop design, alone, had been produced and sold. (Production Log of the John Deere Waterloo Tractor Factory 1929-1972, pp. 43-44.) As noted previously, the Model 620 became the tractor that was most commonly paired with the Model 22 cotton picker. Although there were substantial cosmetic differences between the 20 series tractors and their corresponding models of the 30 series, the tractors, underneath these cosmetics changes, remained almost identical. Once again, it was expected by Deere and Company, that the four-plow Model 630 row crop tractor would be the tractor most often sold together with the Model 22 cotton picker. Accordingly, the Company continued to ship a large number of Model 630 John Deere tractors the cotton raising areas of the southeastern United States. Though grown only in the southern regions of the United States, no other crop, grown in the United States, has had the impact on the history of the nation as has cotton. In colonial days, cotton was regarded as involving too much hand labor at all stages of its production to be considered a profitable cash crop. However, development of the cotton gin, in the 1790s, finally mechanized one stage of the raising and processing of cotton. The cotton gin provided a rapid process for the removal of the seeds the cotton bolls. Although Eli Whitney is most often given sole credit for development of the cotton gin, he had had a great deal of help along the way. In 1788, Joseph Eve developed a two-roller device to remove the seed from Sea Island cotton. Sea Island cotton derived its name from the fact that it was originally grown on the islands of the Caribbean. Sea Island cotton is a beautiful “long staple” cotton with fibers which vary from 1 ¼ inches to 1 9/16 inches in length. It is used for making fine cotton fabrics. However, since this “long staple” cotton could only be successfully cultivated on the 30 or 40 mile stretch of coast in South Carolina around Hilton Head, cotton planters over the rest of the state of South Carolina turned to growing “short staple” cotton, particularly Upland cotton. However, Upland cotton, with fibers measuring from 7/8 of an inch to 1-5/16 inches in length, was much harder to gin. The Eve gin did not work on Upland cotton. However, some un-named African slaves in South Carolina came up with a comb that greatly improved the hand process of removing the seeds from Upland cotton. Hodgen Holmes also developed a saw-tooth designed ginning device to clean Upland cotton. Eventually in 1793, Eli Whitney introduced his cotton gin which worked successful in Upland cotton. The mechanization of ginning Upland cotton created a revolution. Whereas, a single person working by hand, all day, could tear the seeds out of about two pounds of Upland cotton, that same person operating a small gin could clean 50 pounds of Upland cotton in an average day. Replace the hand crank on the gin with water power or animal power, and the production capacity of the gin was increased to 500 pounds in an average day. Suddenly, cotton became very profitable for planters all across the South Carolina and Georgia. Within four years after he completed development of his power gin, Eli Whitney had 30 copies of his gin working in the state of Georgia. Whereas, in 1790 only 1,567,000 pounds of cotton were raised in the whole of the United States, by 1795, just five short years later, 8,358,500 pounds of cotton were raised and that was just beginning. By 1800 cotton production reached 36,572,500 pounds, then 73,145,000 pounds in 1805 and 104,493,000 pounds in 1815. Westward expansion of the United States brought settlers to new Mississippi Territory which had been formed in 1798 from lands stretching from Georgia’s western border to the banks of the Mississippi River. Settlers flowed down the “Natchez Trace,” a trail through the woods starting in Nashville, Tennessee and ending it the small Mississippi River port town of Natchez. Although, part of the overall “westward migration” across the North American continent, the settlement of the Mississippi Territory actually began in Natchez on the west side of the Territory and spread east and north within the Territory. The settlement became a torrent and by 1817 the Mississippi Territory was divided almost in half and the western portion of the Territory entered the union as the State of Mississippi. The eastern half soon followed in 1819, entering the union as the State of Alabama. On the Mississippi Delta, early cotton planters found everything they needed for growing cotton on a large scale—everything, that is, except for the large amounts of labor. They needed large amounts of labor for the planting, chopping, cultivation and picking of the cotton. Although the invention of the cotton gin had brought about the mechanization of the processing of cotton, neither the cotton gin nor any other modern invention had done a thing to mechanize these aspects of the cotton plantation. To fill this need for labor the cotton planters turned to a vast expansion of the institution of slavery. This large scale expansion of slavery depended on the sale and exportation of human beings on the coasts of Africa and their importation and re-sale in the United States. Planters on the Mississippi Delta used slave labor to cultivate wide areas of the Mississippi Delta. There was another explosion in the production of cotton in the 1830s as cotton plantations sprang up all across the southern United States. Nationwide, cotton production mushroomed from 365,726,000 pounds in 1830 to 530,355,500 pounds in 1835, then to 673,116,000 pounds in 1840 and finally to 902,111,500 pounds in 1845. The boom in cotton production was also accompanied by a large scale increase in the enslaved population of the United States. In many of the counties of the Mississippi Delta the number of African slaves out-numbered the free whites. Slavery create wealth for the planters, but the institution of slavery had a catastrophic effect on the relations between the individual states of the United States and lead directly to the War Between the States from 1860 through 1865. Following the Civil War, the legacy of slavery continued to have a corrosive effect on the social relations between the white and black Americans in the north as well as in the south. Just as, before the war, some counties of the Mississippi Delta contained more black than white people. Taken as a whole, the Mississippi Delta contained nearly as many black citizens as white citizens. In the post-war era, the plantation/slave labor system of cotton raising, was replaced plantation/share cropper system. The share cropper system was also exploitative of the free black families living on the Mississippi Delta. Rather than being bound to a plantation by the laws protecting slavery, the black families were bound to the plantation by economic ties, including a debt for living supplies at the local general store which may be owned by the same plantation owner for whom they sharecropped. The sharecroppers and their families supplied labor for working the fields of the plantation on a year-around basis. However, in the busy times of cotton chopping and cotton picking, even more help was needed. Thus, there arose a large group of persons lived on the Delta, who lived outside the sharecropping system and received their income only for this part-time employment as a farm laborer in the spring, summer and fall. Both inside and outside the sharecropping system, life was full of poverty, disappointed ambitions and racism. As a nostrum, for these problems, many workers sought comfort in the local “juke joint.” A juke joint served intoxicating drinks. The choice of drink was usually limited to whatever “moonshine” from whatever local distillery happened to be available at the time. Drinks were served in pint or quart-sized fruit jars. Accommodations of the juke joint were rustic and the typical juke joint was hidden away in some remote and inaccessible location in the most rural areas of the Delta. Being located where they were, in a rural areas, the juke joint sought to avoid attention of local racial hate groups and local law enforcement. Fights, knifings and shooting were not unknown in juke joints and were a mere reflection of the feeling of hopelessness that permiated the atmosphere of the Delta. However, in this environment of seeming absolute despair something beautiful arose. The juke joint became the birth place of a new form of music called “Blues Music” or the specifically that variant of the blues called the “Delta Blues.” (A typical juke joint complete with blues music and a fight is portrayed in the 1985 movie The Color Purple.) Only later, did blues music make it way north, first to Memphis, Tennessee, where W. C. Handy began transcribing, writing and orchestrating the Delta Blues. (For this work, W.C.Handy became known as the Father of the Blues.) Later, blues music made its way north to Chicago, Illinois; Detroit Michigan and Harlem in New York City. These communities also became the favored destinations for the tide of of Afro-Americans seeking a better living than they had on the Mississippi Delta in the years following World War I.
Blues music of has long been the music of life in Memphis and the juke joints of the rural Mid=South region around Memphis. Several different cotton harvester designs were being used experimentally, in the 1930s. However, only two designs were to successfully mass produced—the cotton stripper design and the spindle-type cotton picker design. The cotton stripper combed the entire cotton plant with brushes to remove the cotton bolls. Thus, the cotton stripper basically destroyed the cotton plant as it harvested the cotton bolls. Therefore, the cotton stripper would make only one pass over the cotton field harvesting the cotton. The spindle-type cotton picker on the other hand, removed the cotton bolls while leaving the unopened bolls unharmed. These unopened bolls would be allowed additional time on the cotton plant to mature and open for harvesting at a later date. The cotton stripper has become popular in the western end of the cotton belt—Oklahoma, Kansas and west Texas—where growing season was too short to allow for any more than a single pass over the cotton field. Among all the competing designs for a spindle-type cotton picker, three patented designs drew the most attention. The first was the Price-Campbell spindle-type design. The second was the spindle-type cotton picker designed by brothers, James Daniel Rust and Mack Donald Rust. Thirdly, there was the spindle-type cotton picker patented by Hiram M. Berry of Greenville, Mississippi. Since 1880 Angus Campbell of Chicago, Illinois had been working on a spindle-type cotton picker. In 1912, Campbell joined with Theodore H. Price to form the Price-Campbell Cotton Picker Corporation. In the mid-1930s, the International Harvester Company purchased the Price-Campbell patents. In 1940, Chief Engineer for the International Harvester Company changed the Price-Campbell cotton picker from a pull-type machine to a cotton picker which mounted on the rear end of a row-crop tractor. The tractor and mounted picker was designed to move across the cotton field in reverse while picking cotton. In 1942, the International Harvester Company successfully tested this spindle-type cotton picker. Because of the wartime economic restrictions, the International Harvester Company could not get the cotton picker into production. Finally, in 1949, the Company completed its new facility on the north side of Memphis, Tennessee and began mass production of the cotton picker. Meanwhile, the Rust brothers who had been born in Texas moved to Memphis, Tennessee in the mid-1930s and began work on their own spindle-type cotton picker design. All spindle-type cotton pickers removed cotton from the hulls of the cotton plant by snagging the cotton fibers of the boll with rotating spindles. The rotating spindles on the Price-Campbell design and the Hiram M. Berry design were barbed spindles. The barbs on these spindles snagged the cotton fibers. The Rust brothers cotton picker featured smooth spindles which were slightly moistened as they rotated. The moist spindles snagged the cotton bolls as effectively as the barbs. In 1936, the Rust cotton picker was successfully demonstrated at a public exhibition at the Delta Experiment Station near Leland, Mississippi. After the successful exhibition of their cotton picker the Rust brothers continued to make improvements to their cotton picker all through the Second World War. In 1949, the Rust brothers signed an agreement with the Allis Chalmers Manufacturing Company to allow Allis Chalmers to mass produce a two-row cotton picker based on the Rust patents. The manufacturer’s suggested retail price was $17,500 for this two-row cotton picker. Meanwhile, the John Deere Company had been working on various cotton stripper and cotton picker designs since the 1920s. In 1931, the Company suspended all work on cotton harvesting equipment. However in 1944, the company purchased the Hiram M. Berry patents and soon began manufacturing the single-row Model No. 1 cotton picker which could be mounted on any of the full-sized John Deere row crop tractors. In 1951-1952, the John Deere Company built a warehouse/branch house at 2095 Lantham Avenue in northern Memphis, Tennessee (1950 pop. 400,000), specifically to aid in the distribution of the new cotton picker and the other John Deere tractors and farm equipment to all the local John Deere dealerships in Mid-South area—western Tennessee, eastern Arkansas and northern Mississippi. In the fall of 1956, the John Deere Company announced that the Model No. 1 mounted cotton picker would be replaced with the new improved version, Model No. 22 cotton picker for the 1957 season. When the Second World War ended in September of 1945, it was clear that great changes were being wrought in rural America by the fact that the modern farm tractor was replacing the horse on the average farm in rural America. During the war, new modern farm tractors had been hard to obtain because of the mobilization of the whole economy of the United States for the war effort. However, once the war was over, sales of farm tractors skyrocketed. As use of the farm tractor became universal in rural America, the cost of producing an average bushel of corn began to decrease. Consequently, there was a long term decrease in the market price of corn which had started prior to the recent war and was now continuing with abandon in the post-war era. The family farmer needed to raise more bushels of corn to make up for the decrease in the price of each individual bushel. Thus, the long-term decrease in the price of a bushel of corn, was putting the economic pressure farmer to “get big or get out” of farming altogether. The effects of this economic trend were evident. Whereas, in 1940, farming had employed 18% of the North American population, by 1950, just ten (10) years later, this figure had fallen to only 12.2%. During the same period of time, the number of farms in the United States had decreased by almost 1 million farms, from a figure of 6,102,000 farms to a low of 5,388,000 farms. At the same time, the average size of the United States farm had increased from 175 acres in 1940 up to 213 acres just ten years later in 1950. The trend toward bigger farms had always had its first and most deleterious effect on rental farm agreements. A rental farm agreement usually meant a division of the crops in half, with one half going to the renter, who performed the work on the land, and the other half going to the landlord, who owned the land. In other words, two families were attempting to live off the crops of the same piece of land. Even now in the post-war era, the owner of a small farm of 160 acres or less might be able to make a living. However, chances of a renter bring able to make a living on his share of the crop of a 160 acre farm were becoming increasingly doubtful. The story of the Engstrom farm of LeRoy Township, Minnesota is one such story of a post-war farm rental agreement. Like the previous article in this series, this story begins with a Swedish immigrant to America. Just like Albert Anderson in the article in the previous issue of Belt Pulley magazine, August Engstrom was born in Sweden and immigrated to the United States. (See the article called “The Allis-Chalmers Model WC: the Styled Version” contained in the July/August 2007 issue of Belt Pulley magazine.) However unlike Albert Anderson, who immigrated to the United States in 1909 and came through the immigration process at Ellis Island in New York harbor, August Engstrom was a part of the much larger Swedish wave of immigration which arrived in the United States between 1865-1892, before United States Immigration Service had even opened the Ellis Island facility. Born in Sweden on April 24, 1874, August Engstrom had immigrated to America with his parents in 1881 as a seven-year-old child. The family settled near Rockford, in northern Illinois. In 1900, the age of 24, August married Edna Preston. Together they moved to a farm near Byron, Illinois, in Winnebago Township in Winnebago County, Illinois. They entered into a rental agreement to work the farm. However, they dreamed of saving enough money to purchase their own farm. On this farm in Illinois, they lived and started their family with the birth of a daughter, Frances (Ruth), in 1902 and a son, Verne H., on January 28, 1904. This was the “golden age” of farming and by 1905, August and Edna were ready to move to a farm of their own. They took the money that they had saved and moved to LeRoy Township in Mower County along Minnesota’s southern border with Iowa. There they purchased and moved onto a large 320-acre farm located in southeastern LeRoy Township in 1906. On their new farm their family continued to grow with the birth of a daughter, Danna, born in 1907; another daughter, Doris, in 1908; a son, Glenn, born in 1911; another son, Charles, born in 1913 and, finally, a last son, Eugene born in 1917. Excluding the building site and the small 15-acre permanent pasture located just north of the buildings, the farm consisted of about 300 arable acres. On this farm, there was about 70 acres of hay and 100 acres of oats were raised each year. All the hay and nearly all the oats would be consumed on the farm as feed for the horses, chickens and pigs. Corn was the largest cash crop. About 70 acres of corn was raised each year. Initially, barley had served as the farm’s second cash crop. However, during the prohibition years there had been less demand for barley for malting beer. Accordingly, August and his neighbors, in Mower County had switched to raising flaxseed. Flaxseed was predominately processed and used as “linseed oil.” Linseed oil was used on leather, mainly horse harnesses, to preserve softness and flexibility of the harness. Each year, the crops were rotated from field to field in order to avoid depleting the soil. In this rotation, the hay field of the prior year became the pasture land for the current year. The old pasture land of the prior year had to be plowed and converted into a corn field. Naturally, August needed help to work such a large diversified farm. First there were a great number of horses that needed care and feed year around. Then there were the dairy cows that needed to be milked and fed twice a day, the pigs and the chickens to be fed and cared for. Accordingly, when Lewis Hatlestad, the United States Census taker, showed up on the Engstrom farm on Friday, April 29, 1910, he found that a 23-year old hired hand, Joe Thelen, was living on the farm with the family. Joe helped with milking the cows and feeding the pigs in the winter. During the summer, Joe helped with the field work. However, the size of the farm required that August hire on even more help, on a temporary basis, during the busy times of the summer. Nonetheless, these years continued to be good years for the Engstrom family fueled by high commodity prices for farm products during the First World War. Following the post-war recession which occupied the first few years of the 1920s, good prices for farm cash crops—most importantly corn—returned. Though the price of corn never reached the high level it achieved during the First World War, there was a return to a decent price which allowed a corn farming family, like August and Edna, made a good living on the farm even after paying the hired help. Like their neighbors, they suffered through the worst part of the Great Depression and felt the economy start to recover in the mid-1930s. However, by 1940, August was 65 years of age and Edna was 64 years of age. Thus, they began to plan for a retirement from farming. Because none of their children were showing any immediate interest in taking over the farming operation, August and Edna determined to sell the farm. Among the people who were interested by the news that the Engstrom farm might be up for sale, was Frank Klassy who was living with his father on the farm immediately adjacent to the Engstrom farm to the west. Consistent readers of the Belt Pulley will recognize that Frank Klassy was the son of Matt and the late Ada (Loveland) Klassy. (See the article called “The Decline of the LeRoy Equipment Company” contained in the November/December 2006 issue of Belt Pulley magazine.) As noted previously, Matt and Ada had purchased the present Klassy farm from Hans Rudolph in 1909. Born on September 10, 1902, Frank had spent most of his young life on this farm. Along the way there had been much hardship and tragedy. Frank’s younger brother Frederick was killed in a bizarre accident on October 19, 1922, when he choked to death on a pebble that he threw up into the air and caught in his mouth. Frank’s mother Ada died on March 16, 1934, after an illness and an unsuccessful operation in Rochester, Minnesota. To help his father on the farm, Frank had ceased his schooling when he was 15 years of age. It would take Frank eight additional years to complete his high school education. Eventually, Frank graduated from LeRoy Public Schools, at the age of 26 years, in the class of 1929 with his younger brother, Wilbur. A few days after graduating from high school, Frank Klassy married Esther Ann Lamon on June 5, 1929 in an open air ceremony held at the LeRoy Municipal Wildwood Park. (Wildwood Park has since become Lake Louise State Park.) Together they moved back into the house on the farm with Frank’s parents. In May of 1930 Esther gave birth to a daughter Jeanne. Later, the family was expanded with the birth of a son, Donald F. Klassy, born on April 27, 1932 and another son, Robert E. (nicknamed Buzz) Klassy born on August 4, 1936. Wildwood Park near LeRoy, Minnesota (Now incorporated into the larger Lake Louise State Park). Now in 1943, he and Esther were looking forward to having a home of their own. The Engstrom farm looked like the perfect opportunity. They would be living on their own farm, yet they would be close enough to the home farm that Frank would still be able to cooperate with his father in summer field work and share horses and farm machinery. Accordingly, Frank and Esther began to negotiate the purchase of the Engstom farm. However, Frank’s father, Matt, had also been thinking about the future. He was now 68 years of age and he had been widowed for nine years now. He was tired of living alone. He had been seeing Doretta Spencer, a widow who lived in the town of LeRoy. Together they had made plans to marry. Matt wanted to retire from active farming but did not want to leave farming altogether. He made plans that when Frank and Esther moved off the farm, he would also move off the farm. He and Doretta would marry and they would move into her stucco house located at the corner of Luella Street and North Broadway Avenue directly across from the Presbyterian Church in the village of LeRoy. Matt thought that he and Doretta might live rather comfortably in retirement on the rental income they could receive by renting out the home farm. As he related these new plans to Frank and Esther, Frank began to think about purchasing the home farm from his father rather than purchasing the Engstrom farm. In order to remain involved in farming, Matt, in turn, began to think about purchasing and renting out the Engstrom farm. With the current record high prices that were being received by farmers for their crops because of the World War in Europe and the Pacific, Matt wanted to remain involved in farming to some extent. Accordingly, in 1943, public records reflect that Matt purchased the 320 acre farm from August and Edna Engstrom. However, inside the Klassy family the purchase of the Engstrom farm is referred to as a “trade” or “swap of farms” between Matt and his son, Frank. In actual fact, August Engstrom sold only a 5/6ths interest (or an 83.34% interest) in the farming operation to Matt Klassy. August Engstrom retained the remaining 1/6th interest (or 16.66% interest) in the farm. Probably, he wanted to keep his options open for the future, in case his own children expressed an interest in purchasing the farm sometime in the future. If ever Matt Klassy wanted to sell the whole farm to a third party, August would have agree to sell his 1/6% interest to the same third party. Few buyers would be interested in purchasing only part interest in a farm. The 1/6 interest retained by August would give him a chance to buy back the 5/6ths interest in the farm, if he so chose, before the whole farm was sold to a third party. Both Matt and August, hoped to live in retirement on the landlord’s share of the crop from the farm. So the crops raised in the farming operation were now expected to support three families. The renting family collected the renters share of the crop and the landlord’s share of the crop would be split between Matt Klassy and August Enstrom. On October 10, 1944, Matt married Doretta Spencer and he moved into Doretta’s house. Matt and Doretta planned to live off the proceeds of the Klassy home farm to his son, Frank, and from the rent obtained from his 5/6ths interest in the Engstrom farm. The degree of comfort that this arrangement allowed for each of the three families rested heavily on the relatively high prices that the farmers of North America were receiving for the crops they raised during the current war. Matt Klassy and August Engstrom found renters for their farming operation during the war. However, during the post-war era, the landlords once again needed to find another renter. They advertised and they found Curt Foster. Born on December 9, 1921 to James C. and Myrna M. (Gorder) Foster, Curt had been raised on the family farm in Jenkins Township, Mitchell County in northern Iowa. He married Mary Ellen Aspel and they started a family. In 1947, a daughter Karen Kay Foster was born. In the months following the birth of Kay, Curt and Mary became aware of an opportunity to rent the large Engstrom farm located in LeRoy Township about 17 miles northeast of their hometown of Riceville, Iowa. The Engstrom farm was located just across the Iowa-Minnesota State Line. Curt and Mary moved their family onto the Engstrom farm on March 1, 1948. Other changes were afoot in 1948. On December 8, 1948, August Engstrom died. Eventually his 1/6th share in the farm was sold, by his widow, Edna, to Matt Klassey. Moving to the large Engstrom farm, Curt Foster worried about the changes that had been wrought on farming by the recent war. The much anticipated post-war recession had not occurred because of continued economic aid which the United States had offered to war-torn countries of Europe and Asia including Germany and Japan under the Marshall Plan. The Marshall Plan pledged the United States to financing the recovery of all these countries. Based on the demand for corn created by the Marshall Plan, the price of corn remained at around $2.00 per bushel and United States farmers were encouraged to continue to grow crops from “fence row to fence row” just as they had during the war. Now in early 1948, Curt Foster was still worried, however. The countries in Europe and Asia would, sooner or later, recover and the Marshall Plan would come to an end. What would happen then? Perhaps the post-war recession would only be postponed and not avoided altogether. Before moving to the Engstrom farm, Curt had sold his 1947 crop of corn. The very wet spring of 1947 had resulted in very late planting of corn in Mitchell County, Iowa. Consequently, as a result, the average corn yield in Mitchell County was reduced by 31.0% in 1947. Luckily, the nation-wide production had also been reduced. This meant that there was no glut of corn on the market and the price remained higher than normal—$2.74 per bushel as an average for the full month of January 1948. Riceville was located on the border between Mitchell County and Howard County Iowa. Both Mitchell County and Howard County were heavy producers of corn. Corn predominated in these two Iowa counties as the major cash crop. However, in Mower County, Minnesota, where the Engstrom farm was located, significant inroads were being made by a new cash crop—soybeans. Mobilization for the war effort had developed many new products and caused new industries to spring up. One of these new industries was the plastics industry. Plastics had been required for the war effort. However, in the post-war era, plastics had converted easily into many new peacetime uses. Consequently, the post-war demand for plastics was still broad and growing. Soybeans were the main raw material used in making plastics. As a result, the market demand for soybeans, grew proportionately with the demand for plastics. United States production of the soybeans nearly doubled from 107,197,000 bushels for the 1941 growing season to 187,524,000 in 1942. However, demand for soybeans remained so strong that the price actually rose from $1.55 per bushel in 1941 to $1.60 per bushel in 1942. When the war ended, in 1945, despite the continuing increase in production of soybeans during each year of the war, the price of soybeans had actually increased to $2.03 per bushel. Rather than falling off at the end of the war, as industries converted over to peacetime production, the price of soybeans rose, in 1946, to $2.57 per bushel. In 1941, only 17,800 acres in the whole of Mower County had been planted to soybeans. However, during the war, the amount of acreage of the county planted to soybeans had grown to 51,500 acres. Ever since the end of the war, soybeans continued to grow as a second cash crop on farms in Mower County. Already in 1947, farmers of Mower County were planting 40% of their cash crop acreage in soybeans. Because the terribly wet conditions and the late planting had ruined the soybean crop in 1947, soybean prices had continued to soar until now in early 1948 they were reaching $3.33 per bushel.